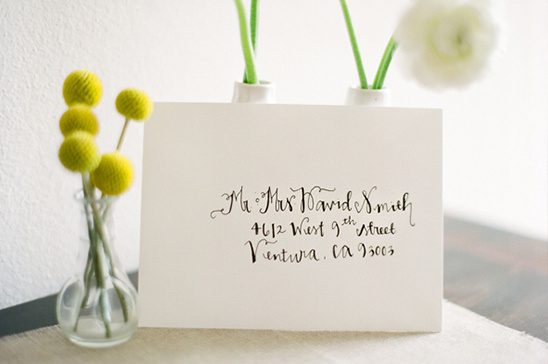 Expertly done calligraphy is truly an art-form. 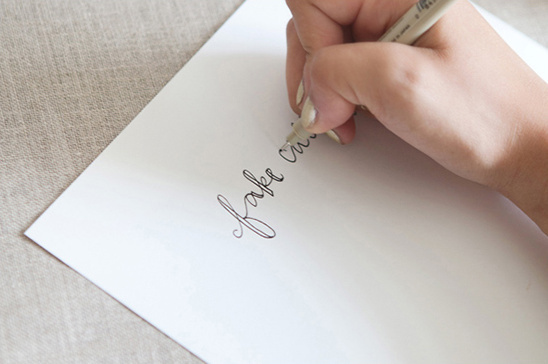 So before we begin, truth be told that our few tips on how to fake calligraphy are not going to teach you how to master the art or give you a highly skilled hand. For special occasions like your wedding, hands down we recommend hiring a professional. We listed a few below for just this occasion. 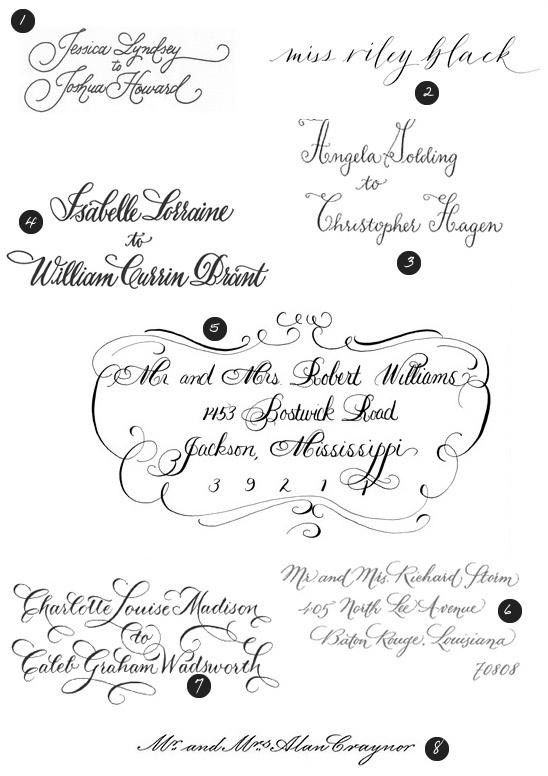 They can elegantly hand inscribe each of your envelopes and ensure a beautiful presentation. These tips are simply for all those other occasions when you want to make address your envelope correctly and have it look super pretty. A special thanks to event stylist a Charming Occasion for sharing these lovely tips with us and Danielle of Lavender and Twine for the photographs, both part of our Hand-Picked Collection. Before you begin, you’ll need to find a good pen to use. Any pen that has thick ink will work, but it’s all personal preference. Don’t be afraid to test a few different pens out before settling on one. I like to use the Micron 05 pen. 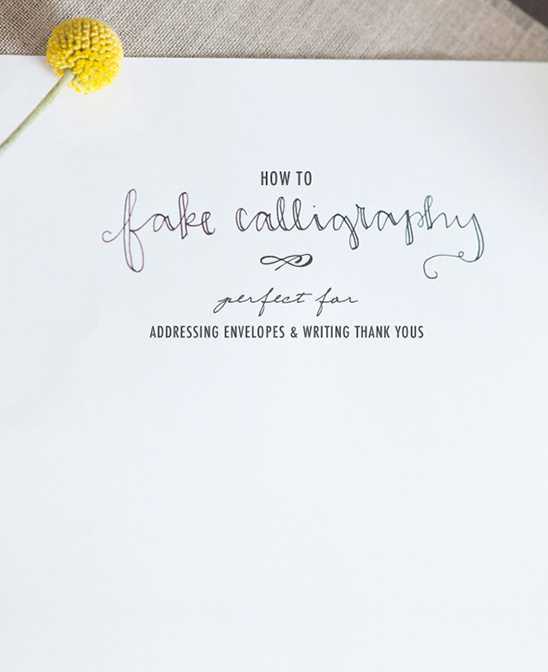 You don’t need to have the nicest handwriting in the world in order to fake calligraphy. If you don’t like your handwriting, just practice! Look up different styles that you like online, and emulate them. No need to copy or trace anyone else’s writing, just use it as inspiration. Note how the letters are formed and how they connect to one another. Research different techniques, find the right pen for you, and waste a lot of paper. Feel free to use as many loops and swirls as you like. Add them on to the end of your words, or onto your capital letters. Whatever you do, let it flow naturally. Traditional calligraphy pens give different strokes with varying thicknesses. So, the goal is to create this variation in thickness on your own. 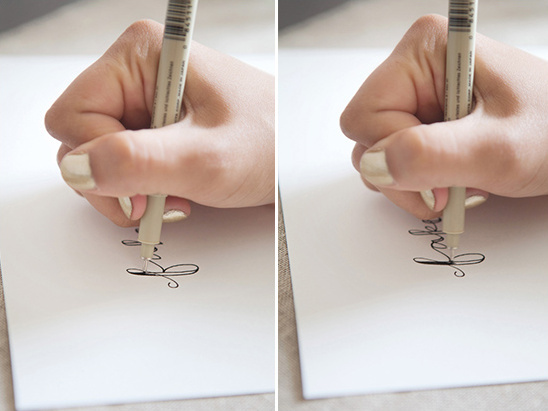 In order to do this, draw a line next to the longest stroke of each letter, and just fill the space in with your pen. It can take some time to do multiple letters in this way, but the outcome definitely looks nice! And again, as long as you keep practicing, you’ll find what works best for you. Again a special thanks to Central California Charming Occasion for sharing this with us. Joelle is also part of our exclusive Hand-Picked collection you can peruse more of her pretty work here.